Byers' Choice St. Nick's Toy Shoppe Musical Advent Calendar is thoughtfully designed with every secret door that has space for a tiny treat for that December day.Plays 12 different classic songs: Hark, the Herald Angels Sing; Oh, Christmas Tree; Good King Wenceslas; Joy to the World; Jingle Bells; Have Yourself a Merry Little Christmas; The Twelve Days of Christmas; O Come, All Ye Faithful; We Wish You a Merry Christmas; Deck the Halls; A Christmas Song; Silent Night.The Byers Choice campus is dedicated to bringing the special warmth and traditions of Christmas into your home. You will love building or giving a collection of Byers Choice fine handcrafted gifts. 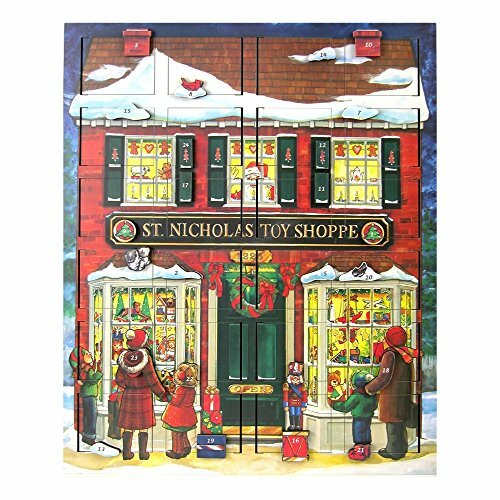 Byers' Choice St. Nick's Toy Shoppe Musical Advent Calendar is thoughtfully designed with every secret door that has space for a tiny treat for that December day. Made of high quality wood which makes the Calendar durable and last longer! A delight for young and old alike, this advent calendar plays traditional Christmas carols (Hark, the Herald Angels Sing; Oh, Christmas Tree; Good King Wenceslas; Joy to the World; Jingle Bells; Have Yourself a Merry Little Christmas; The Twelve Days of Christmas; O Come, All Ye Faithful; We Wish You a Merry Christmas; Deck the Halls; A Christmas Song; Silent Night ) each time someone opens a door in search of a treat. Comes in sturdy box for storing when not on display. If you have any questions about this product by Byers' Choice, contact us by completing and submitting the form below. If you are looking for a specif part number, please include it with your message.